The Encylopedia of the Gothic features a series of newly-commissioned essays from experts in Gothic studies that cover all aspects of the Gothic as it is currently taught and researched, along with the development of the genre and its impact on contemporary culture. Comprises over 200 newly commissioned entries written by a stellar cast of over 130 experts in the field. 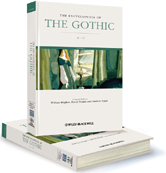 Represents the definitive reference guide to all aspects of the Gothic. Provides comprehensive coverage of relevant authors, national traditions, critical developments, and notable texts that define, shape, and inform the genre. Extends beyond a purely literary analysis to explore Gothic elements of film, music, drama, art, and architecture. Explores the development of the genre and its impact on contemporary culture.